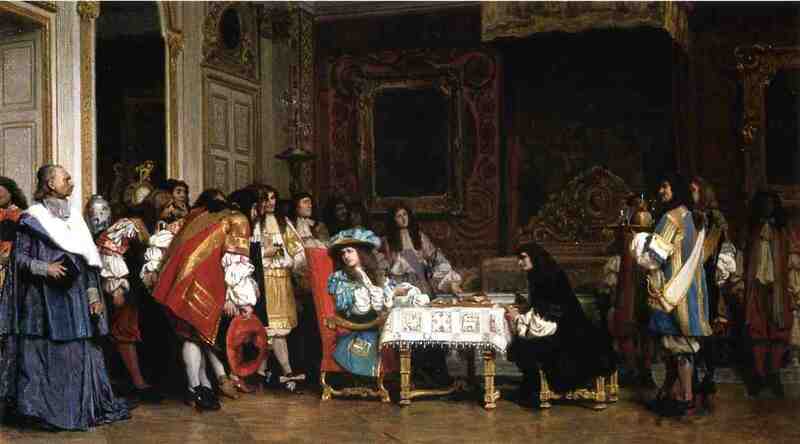 Louis XIV was every bit the grand king he was. He was a handsome man, of elegant and courtly bearing and renowned for his perfection of manners and decorum. Moreover, Louis complemented his graceful physique with his sound judgement and quick apprehension. He neither said too much nor too little. For a king, he worked hard enough, spending the better part of his days attending to government affairs. Being the Sun King, in fact, demanded time and energy. For him to understand and decide on problems that lingered during his reign, he had to rise and toil. While he had ministers around to ably advise him, he always retained for himself the role of the first minister. He never consented to let any adviser dominate him or influence him, like Richelieu did to his father or like his mother had been by Fleury. “The profession of the kind,” he proclaimed, “is great and noble, and delightful it one but feels equal to performing the duties which it involves,”—and he never harbored doubt that he himself was born to reign and rule as king. Louis XIV wanted his surroundings to suit the grandeur of his office. And so, he aimed to have a Court so magnificent no other European rulers would ever outdo him! He commissioned the construction of the enormous palace outside Paris, with interminable halls and apartments and a vast garden stretching away behind it. This palace and its outlying buildings, including two or three less gorgeous residences for the king when he occasionally grew tired of the ceremony of Versailles, perhaps cost the nation a huge sum of money. Thousands of peasants and soldiers were toiled to work in this building without pay. The furnishings and decorations were as rich and costly as the palace was splendid, and still fil the visitor with wonder. For over a century Versailles continued to be the home of the French kings and the seat of the government. The royal splendor and luxury of Versailles helped attract the nobility who no longer lived on their estates and well fortified castles, where they used to plan how to escape from royal control. Instead, they went to Versailles where they lived in grand fashion with the king. They saw him to bed at night and in stately procession they greeted him in the morning. It was deemed a high honor to hand him his shirt as he was being dressed, or at dinner, to provide him with fresh napkin. By living close to the king, the courtiers hope to gain favors, pensions and lucrative offices for themselves or their family. This could even be one step towards gaining a little influence in government.